My granddaughters, Rachel and Allison live on Kodiak Island, Alaska, courtesy of the US Coast Guard. Thanks to Skype, we can read to them weekly. With ballet and buses as current interests, the local library is a source for books on those topics. During our visits, we can have reading marathons. In between, we read them two books during our Skype sessions. The video even allows us to show them illustrations. It’s not a perfect system, but it works. Do you have children? Do you want to set them up for success? 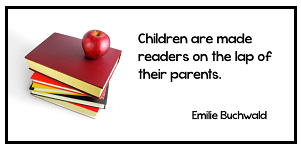 Research suggests that the answer is pretty simple–read to them and have books in your house. Most people have at least one screen; whether a telephone or a TV. If you can afford a phone, television and/or cable, you can afford books. At least, sign up for a library card. Books are an investment in the future. While you may not think twice about buying books, for some families, money extends only to food and rent, if it even stretches that far. Extras, like books, are viewed as frivolous non-essentials. Our Lady Queen of Peace (OLQP) parish in Arlington, VA recognized this dilemma and set up a bookshelf ministry. 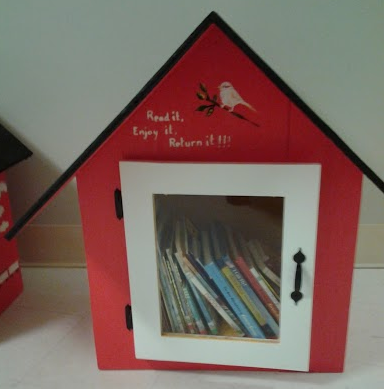 With help from Home Depot, eight little free libraries with children’s books were built and installed in metro DC, including at the church’s food pantry and Arlington’s free medical clinic. It’s never too early to read to your child. Some studies suggest starting prenatally. Yes, that’s right. Read to your baby before she’s even born. My co-madre, Susan, visits first-time moms as a nurse with Nurse Family Partnership (NFP) in central PA. NFP is BIG into reading to children–starting in pregnancy and has a defined curriculum for infancy and toddlers about reading. Sharing books helps your baby develop a love of reading and sets him up for school success. Reading aloud is widely recognized as the single most important activity leading to language development, even before a child can talk.The more words parents use when speaking to an infant, the greater the size of their child’s vocabulary at age 3. 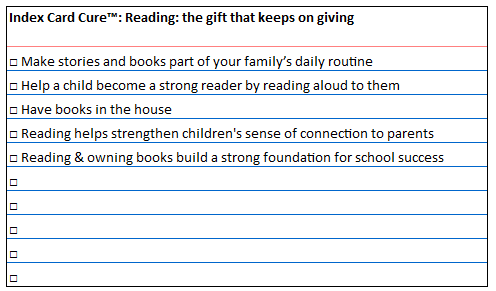 Create an environment that supports reading at home. Success is more attributable to reading and access to books, than private school. “Evidence shows that the difference between those who get bedtime stories and those who don’t — the difference in their life chances — is bigger than the difference between those who get elite private schooling and those that don’t,” said Adam Swift, a British academic. If you can’t afford private school tuition, then make sure that your child has a book to call his or her own. It’s fun. It’s good for you. It helps with children’s sense of connection to parents. It builds a strong foundation for school success. A book is a gift that keeps on giving. To give all children a good start for the future, make sure that they are read to and have books in homes. One of the greatest gifts adults can give—to their offspring and to their society—is to read to children. —Carl Sagan. Have you read to your children today? ← Doesn’t it WORRY you, how much “They” know about you?